Newest edition of the photographic series “Interact with Art” by ArtOfMiami’s own Harold Rosario. 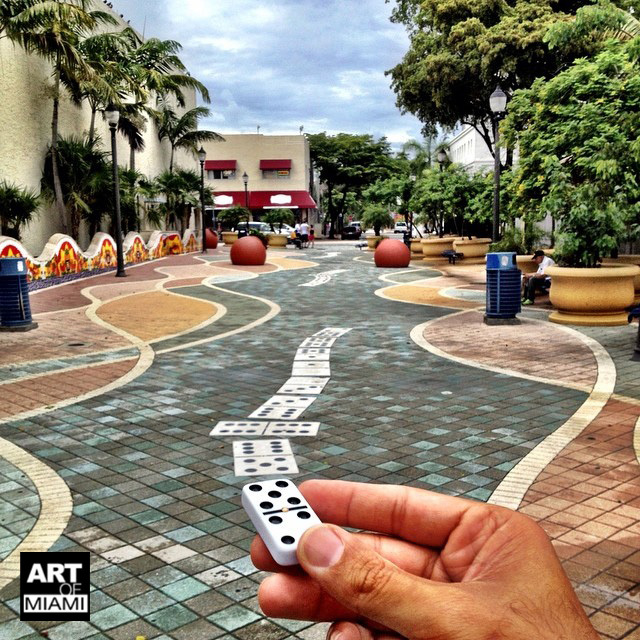 This one takes us to the iconic Domino Park in Miami Little Havana neighborhood. Look around you. There is art everywhere. Recently, I’ve been trying to add to the definition of “Street Art” by embarking on a creative series titled Interact With Art. Here I use social media to engage and awaken followers to the art which is all around us. Using clever sketches, props, poses and a bit of humor, I interact with public art, architecture, sculptures, landscaping, culinary art and the endless supply of art forms that shapes our daily lives. What started as a personal challenge to push my creative potential, evolved into a campaign for art awareness.